Introducing one of our all time best selling scooters . Classic Honda OEM Engine technology starts this package off right. Save a cash and have a blast showing off while your doing it. 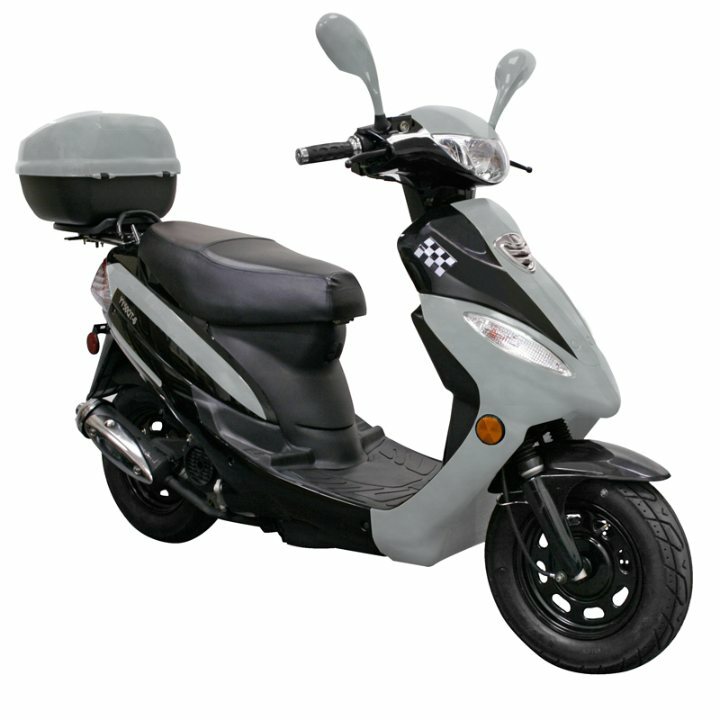 Fast, Fun and our most affordable scooter online. This model has full parts support and is supported by CMS MOTORS. If you're looking for a new moped and don't have alot of money but still want power and quality. This unit might for you. This is a very nice quality college cruiser and at a price that is unbeatable. The perfect A-B cruiser. FREE DELVIERY TO YOUR DOOR! Warranty: Limited Manufacture's 90 Day Warranty. BE A RESPONSIBLE RIDER! FOR SAFETY, READ YOUR OWNER'S MANUAL. ALWAYS WEAR A HELMET, EYE PROTECTION, AND PROTECTIVE CLOTHING! NEVER RIDE UNDER THE INFLUENCE OF DRUGS OR ALCOHOL! ATV's - Parents consider your youngsters age, size, ability, and maturity before allowing them to ride. SCOOTERS, MOPEDS & MOTORCYCLES - Never ride on non-paved streets or non-public roads, and never carry passengers on your moped unless equipped to do so. Never engage in stunt driving or ride at excessive speeds. Be careful on difficult terrain. Riders under 16 years of age must be supervised by an adult. CountyImports.com recommends that ALL riders take a training course. For more information visit the ASI website www.safety.org. We have a put together a great collection of actual course study information, videos and guides. You can have your children watch our atv and four wheeler safety videos anytime for free! If you ever are in need of assistance we are here to help you over the phone! Put our certified technicist to work. The best part is we have product on hand so we can walk through your technical questions with you over the phone. Want to do your own oil change? Need to change the battery? Give us a try! This service is for customers. Please have your order ID ready when calling so we can help you. M-F 10-5 PST 877-300-8707 -OR- you can click here to have a technion call you when you are available. We know you work hard for your money. We also understand the need for peace of mind in a purchase. Now, you have the power to customize your own warranty protection to fit your needs. As a standard, we always offer a free warranty of every single product we carry. We also carry parts for these products. You can browse our parts department here - https://www.countyimports.com . After over 5 years and over 25,000 customers served, we know what coverage will best service you the customer. When adding this item to your shopping cart you will be asked to select your warranty coverage. Remember, there is always a FREE standard warranty offered with every purchase, however we also offer longer coverage periods. Please keep in mind you must PRINT OUT the warranty agreement, sign and mail -or- fax it to our office to become active. We suggest you complete this and mail it while waiting for your new unit to arrive! This way from day one you are covered! Here are the following warranties available. Please note any warranty offered is a parts only warranty. Unless you purchase directly instore from CMS or can bring your machine to our location for service. This warranty however long the term you select will cover everything noted HERE. Please feel free to contact us for assistance or with questions. We are established and dependable- We have been in business for over 12 years and are growing rapidly. For over 6 years, we have gained tremendous experience serving thousands of customers in high dirt bikes, go karts, and scooters. Our knowledgeable staff is enthusiastic, helpful and courteous; we have a great attitude and want your business. We care about our customers and make ourselves easily accessible. Our toll-free number is 877-300-8707. Your satisfaction is our #1 concern. Why get yourself all frustrated & try to get hold of a company never answers the calls? Pick up the phone dial our Toll Free 877-300-8707. We guarantee you will find the best customer services here you deserve. In addition to the MCO, other necessary components to register your cycle and include the federal inspection plate with Vehicle ID Number (VIN), engine ID number stamped into engine casing and the VIN# stamped into frame of unit (located beneath Federal ID Plate). These components are vital in proper registration of your new purchase and CMS provides all documentation required to do so at no additional charge for new customers! Go here for help locating your vin.